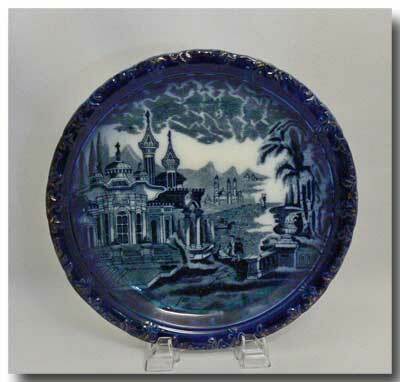 A flow blue plate with a large palace and 3 figures in the foreground. This plate is not marked but the pattern is attributed to the J. Kent (James A. Kent) Pottery in Longton, (Old Foley), Stoke-On-Trent, England and dates between 1897 and 1913. The surface is very good with no crazing, no chips or hairlines. The slightly raised border pattern has some gilt colouring. 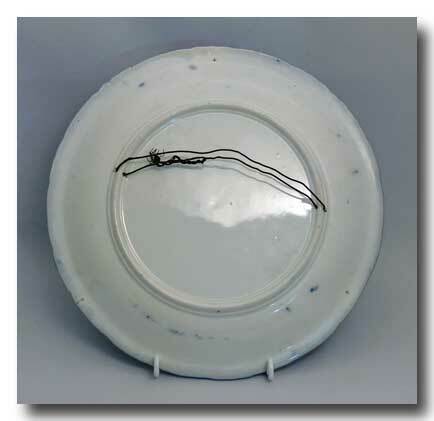 The reverse shows the 3 pontil marks and is wired for hanging. Approx. diameter: 10 ¼ inches.